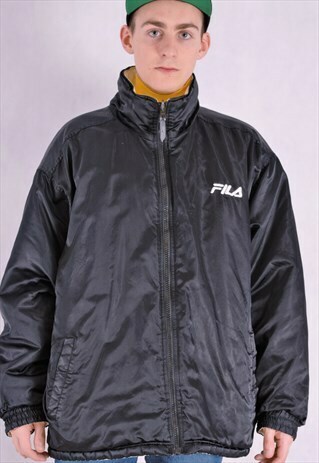 Vintage unique men's Fila waterproof jacket. - good vintage condition - reversible - two side pockets - nice details -nice lining - straight sleeves - very warm and close fit - size L - Our model is 183cm (6') wears size M/L (UK14) -- - Please note, that vintage items have been worn before, so they may have minor signs of wear. - Buyers are responsible for any customs and import taxes that may apply. Please convo me, if you want to mark your parcel as a gift. - Be sure to click 'follow' in the header of our boutique to see new stock first. - If there is something in particular that we may have overlooked, or you need any more details, please feel free to contact us. - We always strive to provide the best possible service to our customers. If you are dissatisfied for any reason, please contact us before giving us less then 5 stars and allow us the opportunity to rectify the situation. We want your buying experience to be a pleasant one and will do our best to help and resolve any issues quickly and fairly. - I'm not responsible for delays due to customs - Estimated shipping times North America: 2-4 weeks Europe: 3-14 business days Australia, New Zealand and Oceania: 2-4 weeks Latin America and the Caribbean: 3-5 weeks - The buyer grants the seller an authorization to conclude on his behalf a contract with the post in order to send him/her purchased goods via mail.